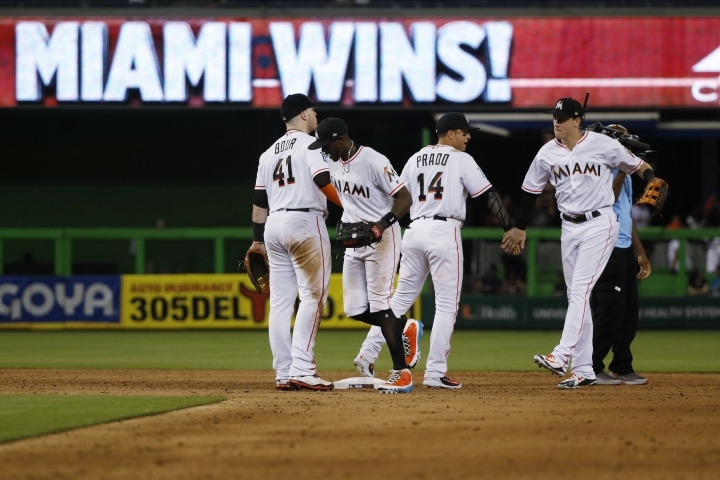 MIAMI — The Los Angeles Dodgers went 0 for 7 with runners in scoring position against Wei-Yin Chen and four relievers and were beaten by a last-place team for the fifth straight game, losing to the Miami Marlins 4-2 Tuesday night. The NL champions managed only five hits after being swept in a four-game series at home by woeful Cincinnati. Alex Wood (0-4) lost despite allowing only one earned run in six innings for the Dodgers (16-25), who are off to their worst start in 60 years. Miami (15-26) could pass them by sweeping the three-game series. Nick Wittgren (2-0) entered in the fifth and worked 1 2/3 perfect innings to lower his ERA to 0.69. Brad Ziegler gave up a home run to Cody Bellinger in the ninth but earned his sixth save. 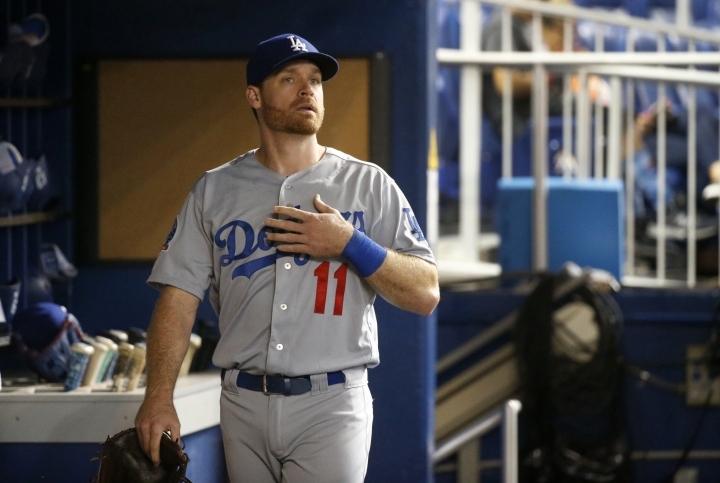 Dodgers infielders Justin Turner and Logan Forsythe were activated from the disabled list but couldn't spark the defending NL champions, who have scored 11 runs during their skid. ANAHEIM, Calif. — Jose Altuve hit a go-ahead, three-run double in the eighth inning, and Houston rallied from a late two-run deficit for a victory over the Los Angeles Angels. Brian McCann had two hits and drove in another run for the defending World Series champions (27-17), who reclaimed sole possession of first place in the AL West. Josh Reddick threw out two Los Angeles runners from right field and also got a leadoff double in the eighth against reliever Jose Alvarez (2-1), who swiftly wasted seven stellar innings by rookie Jaime Barria. Barria yielded four hits and struck out seven in seven excellent innings. Justin Upton and Rene Rivera homered for the Angels. Collin McHugh (1-0) pitched two scoreless innings of relief. Gerrit Cole added seven strikeouts to his AL-leading total, but gave up five hits and left trailing 3-1. SAN DIEGO — Jordan Lyles came (1-1) within five outs of a perfect game and the first no-hitter in San Diego history before allowing Trevor Story's single. Lyles then walked Pat Valaika and made way for Kirby Yates. Brad Hand got four outs to complete the one-hitter and earn his 12th save. Eric Hosmer hit a two-run homer in the first off German Marquez (2-5) and Christian Villanueva hit a two-run drive in the sixth against Christian Villanueva. BOSTON — Stephen Piscotty homered in his first at-bat after being reinstated from the bereavement list and saluted his late mother as he crossed home plate, helping lead Oakland in a game delayed almost two hours because of weather. Piscotty, who returned to the A's Tuesday after missing four games to be with his family, drove an 0-2 pitch from Eduardo Rodriguez out to left in the second inning. He slowly made his way around the bases, then after rounding third placed his right hand over his heart and patted it with a glance to the sky in tribute to Gretchen Piscotty, who died May 6 after battling amyotrophic lateral sclerosis, also known as Lou Gehrig's Disease. Daniel Mengden (3-4) pitched six solid innings for Oakland. Eduardo Rodriguez (3-1) took his first loss of the season after getting roughed up in the first few innings. SEATTLE — Guillermo Heredia's single to left-center drove in Ryon Healy from second base in the 11th inning to lift Seattle. Healy reached on a bloop single to right field off Texas reliever Alex Claudio (1-2) and advanced to second when David Freitas reached on an infield single deep in the hole at shortstop. The late-game rally provided a positive end for the Mariners on a bummer day in which star second baseman Robinson Cano was suspended 80 games for violating MLB's drug policy. Texas tied it in the ninth inning off AL-leading closer Edwin Diaz, who blew just his second save opportunity this season. With one out, Joey Gallo hit a hard grounder right at Healy, who fumbled it for a second before tossing over to Diaz, who outraced the Rangers' slugger to first base. NEW YORK — Noah Syndergaard (3-1) won for the first time in five weeks, knocking in two early runs against the team that traded him to rouse a sluggish New York offense. Missing injured sluggers Yoenis Cespedes and Todd Frazier from a slumping lineup, the Mets finally broke through anyway against Jaime Garcia (2-3) and the skidding Blue Jays after an 86-minute rain delay at the start. Juan Lagares had four hits, three RBIs and a stolen base to help New York improve to 12-0 at home against Toronto — the longest such streak in interleague history, according to the Elias Sports Bureau. PHOENIX — Daniel Descalso singled home Jarrod Dyson with two outs in the eighth inning, and Arizona snapped a six-game losing streak. The Diamondbacks managed just three hits against starter Jhoulys Chacin and three relievers, but starter Zack Greinke stifled Milwaukee over six innings and Arizona tied together just enough offense to get by. Taylor Williams (0-1) walked Jeff Mathis to start the Arizona eighth, and Descalso singled through the shift to score pinch-runner Dyson. It gave Archie Bradley (1-1) a win after striking out two in a perfect eighth. Brad Boxberger tossed a scoreless ninth for his 12th save. PITTSBURGH — Trevor Williams (5-2) scattered six hits in seven innings, and Adam Frazier homered to start a four-run first. Chicago has lost eight of nine and 12 of 14, dropping to a major league-worst 10-28. The White Sox have matched the poorest 38-game start in team history, in 1948. WASHINGTON — Tyler Austin hit a two-run homer and a sacrifice fly as the Yankees rallied from a 3-0 deficit in a game suspended because of rain with the score 3-3 after 5½ innings. The game is scheduled to continue at 5:05 p.m. Wednesday before the finale of the two-game interleague series. DETROIT — JaCoby Jones homered and doubled, and Detroit rallied in a five-run seventh as Andrew Miller (1-2) allowed two inherited runners to score and gave up two runs of his own. Pete Kozma hit a tying, two-run double, and Miller walked John Hicks with the bases loaded. Cleveland led 4-0 on Brandon Guyer's first-inning grand slam and 8-4 before Detroit rallied for its third straight win. Miller faced six batters, giving up two doubles and three walks while getting one out. Louis Coleman (1-0) threw a scoreless seventh and Shane Greene, pitching for the fourth straight day, worked the ninth for his ninth save. ATLANTA — Cubs catcher Willson Contreras helped Chicago throw out two runners at home plate and another at third base before rallying for two runs in the ninth inning. After Ronald Acuna Jr. homered against Carl Edwards Jr. (2-0) for a 2-1 lead in the eighth, Albert Almora Jr. and Addison Russell hit consecutive doubles and Ben Zobrist came through with a two-out, run-scoring single off Arodys Vizcaino (1-2). Brandon Morrow got three outs for his 10th save. MINNEAPOLIS — Bobby Wilson hit his first home run since Sept. 21, 2016, for Tampa Bay, a two-run drive off Luke Gregerson that capped a three-run seventh. Jose Berrios (4-4) surrendered one run on two hits and struck out 10, leaving after hitting Kolten Wong with a pitch with one out in the eighth. Addison Reed struck out both batters he faced and Fernando Rodney retired three straight batters for his eighth save. Brett Cecil (0-1) allowed a double to Logan Morrison starting the seventh, and Morrison scored on Byron Buxton's bunt attempt when Gregerson threw the ball wide of first and into foul territory for an error. KANSAS CITY, Mo. — Jonny Venters (1-0) got two outs for his first victory since Sept. 27, 2012, while with Atlanta against the Mets. The left-hander had been out since 2012 due to four major elbow surgeries, including three Tommy John operations, before returning to the majors this season. Joey Wendle singled in a run with two outs in the ninth against Kelvin Herrera (1-1). Alex Colome worked a spotless ninth for his eighth save. The Royals lost their fourth straight and sixth in seven.